← Meet our newest member of the family…the AAC Ferret! Many schools looking for assistive technology supports that can benefit a wide range of students often turn to Read&Write Gold because of the quality and quantity of the features it contains. 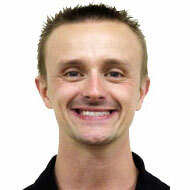 However, it is sometimes difficult to know which feature(s) may benefit a particular student the most. 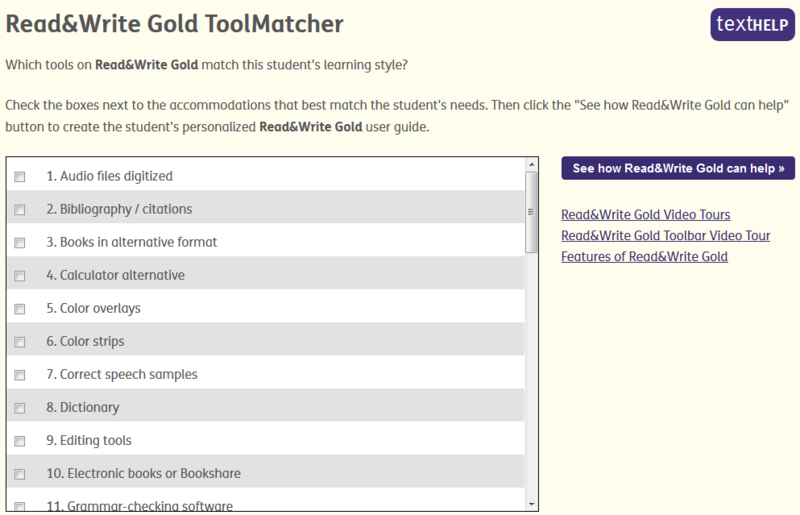 Because of this Texthelp developed a free online tool called Read&Write Gold ToolMatcher to help. A list of accommodations a student may need is listed. Simply scan through the list and put a check mark next to any accommodation the student requires. Click the “Show how Read&Write Gold can help” button towards the top right of the page to view a list of features that best match the user’s needs. You can click any feature to view a video tutorial of how it works and even download the entire list into a Word document to print or save. 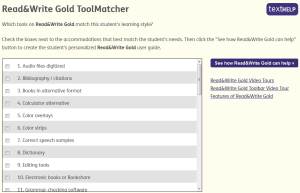 ToolMatcher is great for schools who have just purchased Read&Write Gold and want ideas on how to start using it with individual students. It is also great to use for K-12 students who have an IEP and need supports relevant to their accommodations. Another use for ToolMatcher is in IEP meetings. I remember years ago using an “AT Wheel” from CEC during IEP meetings to help determine which pieces of Assistive Technology may be best for a particular student. While Read&Write Gold is only one of many Assistive Technology options to consider, it does include features to support reading, writing, research, and organisational skills. If a school already has access to the software, using ToolMatcher during the IEP meeting can help team members make better decisions about how the software may be used. Have you tried toolmatcher yet? If not, be sure to bookmark it at www.toolmatcher.com.